Every so often I fall in love with a painting. Most often the object of my desire is in a museum, on someone else’s wall, or too expensive, but once in a while it is within reach. 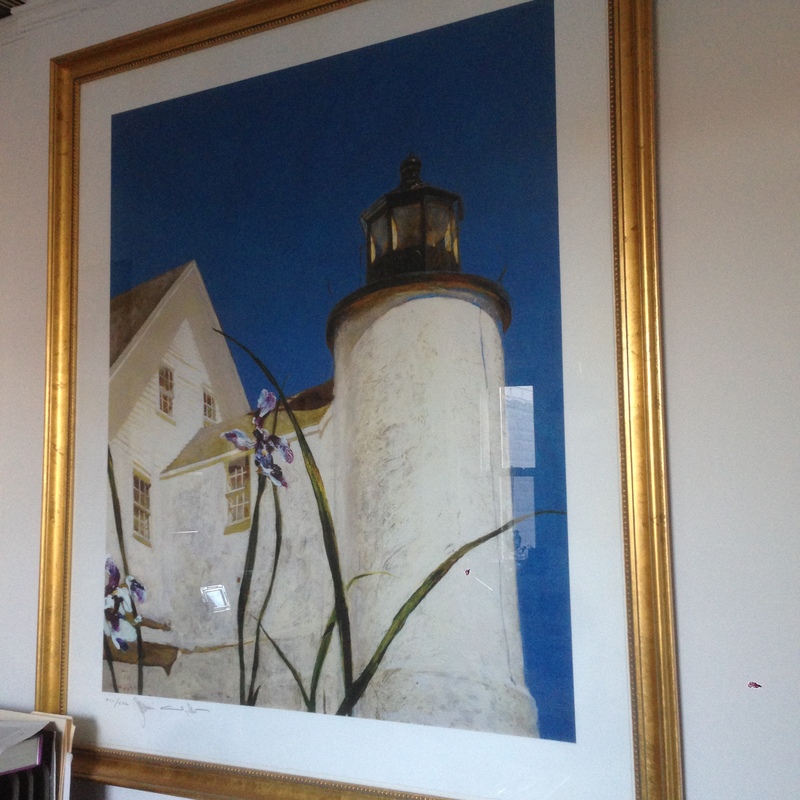 So it was with Jamie Wyeth’s Iris At Sea, a single flower silhouetted against a white Maine lighthouse. I saw it in a gallery on Monhegan Island, Maine, half an hour before I was to catch the ferry that was to carry me back to the mainland. The 1999 print cost $2500, too much money for me to spend on a whim. I never forgot the painting. I toyed with the idea of calling the gallery, but didn’t. The print became very popular and my heart bled each time I saw it or its reproduction. Then, one day the print, beautifully framed in gold, appeared for sale in a tiny frame shop near my home in Brooklyn Heights. This time I did not let it get away. My husband gave it to me for my birthday. The big picture, measuring three by five feet, dominates my small office, but somehow it unites my two worlds: through my window I see a tower of the Brooklyn Bridge; when I swing my chair around by 180 degrees I am in Maine. It is thus with great pleasure that last September I visited Jamie Wyeth’s first comprehensive retrospective exhibition at the Museum of Fine Arts in Boston. It was a marvelous show, filled with realistic, unconventional pictures lacking the angst that fill so many contemporary canvases. Jamie Wyeth and I share a passion for Monhegan, Maine, a two by one mile island that sports the East Coast’s highest cliffs. He also is passionate about animals. Gulls, crows, ponies, geese, a wild ram, a yellow lab with an natural eye patch, and Scotties share the museum’s walls with rocks, cliffs, floating pumpkins, and a handful of famous and not so famous humans. As far as painters go, Jamie Wyeth was born with a silver spoon in his mouth. Not only did he bask in the reflected glory of the laurels America had bestowed on the heads of N. C. Wyeth, his grandfather, and Andrew Wyeth, his father, but he also inherited their talent. He painted at his father’s side from the time he was a small child. Wyeth had other mentors. As a young man he entered Andy Warhol’s famous Factory, befriended Lincoln Kirstein, the dance impresario, and Rudolf Nureyev, the fugitive Russian star dancer. These sensitive images, which hung in the MFA show’s first gallery, earned Wyeth a commission to paint a posthumous portrait of John F. Kennedy. The portrait, painted in 1967 when Jamie was twenty-one, remained in his possession until he partially donated it to the MFA. My heart beat faster as I entered the next gallery filled with images of Monhegan: peaceful gulls assembled in front of the island’s small schoolhouse, gulls fighting with one another, gulls devouring a lobster, painter Rockwell Kent’s house, now owned by Wyeth, perched on a field of rocks, near the sea. A canvas filled with a black-faced sheep with white eyes pierced by rectangular yellow pupils mesmerized me. It is also reminiscent of American Folk Art. Elsewhere I saw another version of “my” lighthouse dwarfed by “my” single blue iris. The image of an oversized pumpkin suspended midair between Monhegan’s cliffs over a wildly churning blue and green sea was almost surrealistic. There was also some ephemera: sketches for a White House Christmas card showing Ronald Reagan’s two Scotties, and doll-house like models of La Côte Basque a fashionable New York restaurant frequented by Lincoln Kirstein, Truman Capote and the like and another of Warhol’s famous Factory. I left with the show with a smile on my face, happy to have indulged my whim. This entry was posted in Art review and tagged american art, art, Boston, Iris at Sea, Jamie Wyeth, maine, monhegan, Museum of Fine Arts, new york. Bookmark the permalink.